The above words were written in the late 50’s boom when Arizona was being discovered as the beautiful little oasis that much of it is, but they could just as well describe Asheville in 2018. Nonetheless, the community that has been created here in the shadow of the Blue Ridge Mountains begs for a continued influx of ideas, of art, of creativity. Without this reputation that has been built, which causes some of the most talented people in the country to move here, the entire scene would eventually become stagnant and inbred. Hoot and Holler, an old time duo (guitarist Mark Kilianski and fiddler Amy Alvey) now making their home in Asheville, is one of those transplants. Not that you would know it, the way their tunes wrap themselves around the trees, the rivers, the very essence of Western North Carolina. For the next couple of years they would begin to work as a touring band, based out of Boston. Still, despite the friends and the wonderful scene (with Berklee and The New England Conservatory based locally) they began to pine for something new. “We were based in Boston for several years, and in my parallel life I had really gotten into rock climbing,” Alvey tells me. “The music scene there is pretty fresh but it feels like it is pretty easy to hit a ceiling as well. Also, I really wanted to climb more and didn’t really want to live in a city. With hundreds of shows, and five West Coast swings under their belt, they knew that wherever they landed needed to have both a thriving scene and a central location. Asheville, as we all know locally, works on both counts. Furthermore, thanks to the wonky rental market and the work of Asheville Riff-Raff classifieds, it’s easier for a traveling musician to find a monthly rental in Asheville than in most other places. And easier to find gigs. According to Alvey, she can find a jam or a gig every night in this town if she wants to, and I have no doubt that’s the case. Old-Time fiddle isn’t going out of style in this town any time soon, especially not when your bow tells stories like a couple of old men on the back porch, passing around moonshine as the summer sun sets. Ambassadors of good old boot-stomping, barn-dancing bluegrass, their touring schedule, which has already taken them all over the country, shows no signs of slowing down, including a working trip to Australia this fall. 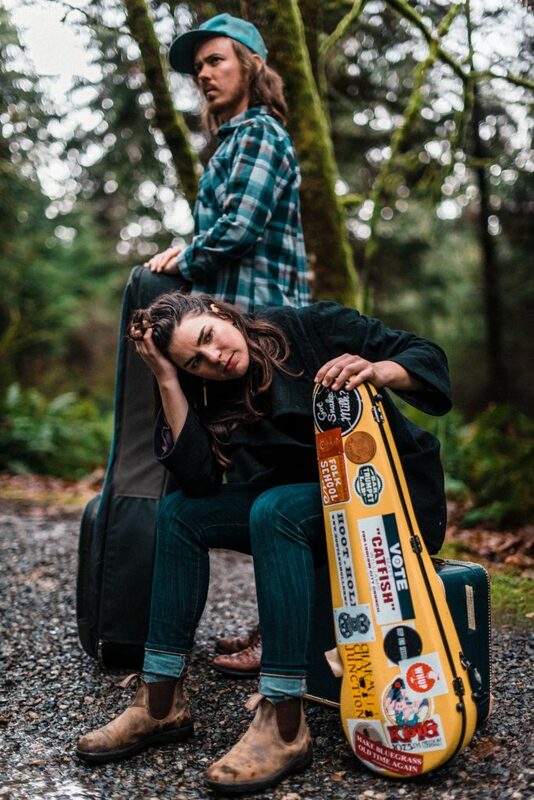 According to Alvey, “there is a lot of interest in American folk music there,” and with multiple festivals and club shows on their itinerary, it will be a chance to put their music, no, our music, in front of a brand new set of listeners. They will be playing at The Isis Lounge on Saturday evening, May 19, and it should be the perfect environment to really take in what they do. If you are looking for something quietly energetic and tastefully backwoods, then I recommend you check this out. Also, if you know of anywhere a couple of musicians could park their van (and live in it) they would love to hear from you. Boone prog-funk favorites Metaphonia will be taking the stage back-to-back with one of Asheville’s rising rock-stars, Jordan Okrend at the Sierra Nevada taproom Saturday afternoon and evening. Metaphonia blends elements of rock, funk, and dance music into an eclectic but still easily digestible mix while Okrend’s soulful seventies rock has been gaining a following not only in Asheville, but all the way through these Blue Ridge Mountains. This is a free show. If you happen to be out in Mills River, or just want to take a drive and enjoy some great music on the beautiful grounds of Sierra Nevada, there could be much worse ways to spend your Saturday evening. Alright, I don’t want to sound like a broken record and I know I just wrote about these cats a few weeks ago, but this band is blowing up fast. Garage rockers, headbangers, analog lovers and intelligent listeners all over the city have been taking notice, and for good reason. The truth is, this band is one helluva lot of fun and, let’s be honest. What else are you really going to be doing on a Wednesday (May 23)?